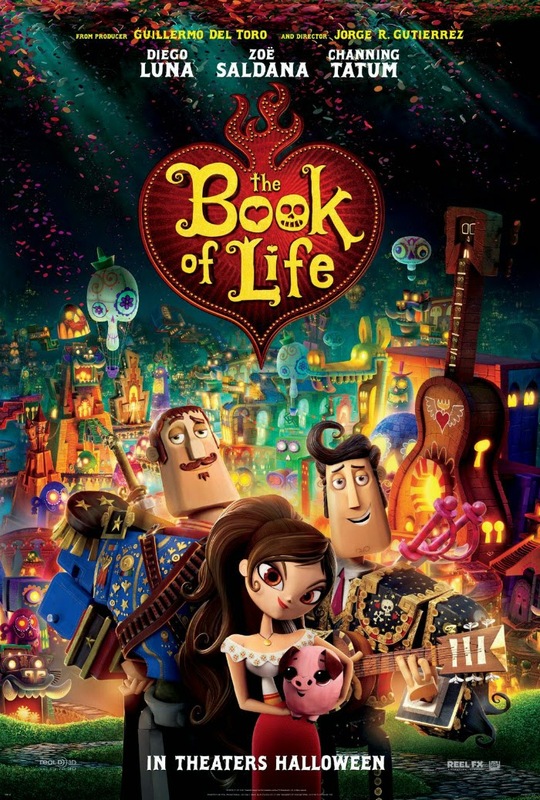 The Book of Life begins with a school bus dropping off a handful of kids in detention at a museum for a tour. What these kids have done, or why they're at the museum, or what it has to do with the rest of the story is not the point. It only serves to bookend the real story. 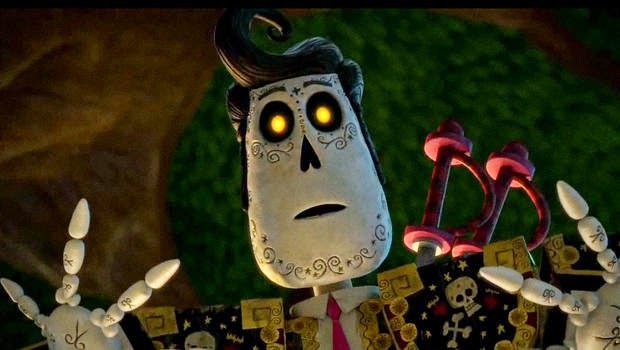 It's "story-ception," a story within a story, and that framing allows for the art style, and the method behind the telling of this story involving the land of the dead and modern pop music. In a way, it's setup much the way a parent might sit their rowdy kids down in front of the TV to distract them for a few hours. Or a baby sitter might try to get the kids to wind down with some music and a story. It contains a lot of jokes that will make a younger audience laugh, and the adults roll their eyes. However, there are some jokes here and there the adults will also enjoy. The tour guide shows them the book of life, which contains all stories. Flip to a page in the book, and the mural on the wall displays images from the story. To take it a step further, the main characters are modeled after wooden toys, as if the babysitter were holding the kids toys as a visualization while telling this story. These wooden puppet-like toys associated with folk-art common to the day of the dead serve as the model for the animation style once we get into the main story. You can see the puppet's joints, and even the texture of the wood work. Fans of Tim Burton's animated films will find a bit of similarity here to enjoy, particularly in the scenes in the land of the dead (or is it the land of the remembered?). While it's still CG animation, it's still a unique look in today's landscape of animated fare. It's almost a cross between the stop-motion claymation look, and the high quality CG look we know from Pixar. The story is a somewhat overly complex, multilayered sequences of events and character motivations, especially considering the target audience. It begins with an explanation of The Day of the Dead: one night each year, families remember and see the ghost of lost loved ones. As long as your family members are remembered, they'll get to live in the land of the remembered, and one night a year families can speak to these loved ones. The complex story involves three childhood friends, Manolo (Diego Luna), Maria (Zoe Saldana), and Joaquin (Channing Tatum), who wind up separated to do their schooling, work training, and growing up. Manolo wants to be a musician, but his father intends for him to honor his families long history in bullfighting. Joaquin trades a loaf of bread for a magical medal that grants the wearer courage, and invulnerability, making him the towns hero and defender against bandits. When Maria gets back from school, the two boys immediately compete for her attention. This competition gets the attention of the married lords of the underworld, La Muerte (Kate del Castillo) who rules the land of the remembered, and Xibalba (Ron Perlman) who rules the land of the forgotten. They pick sides in a bet as to who Maria would pick to marry. Note this isn't a man "winning her hand," it's Maria's choice. Xibalba picks Joaquin, and if Xibalba wins the bet he gets to rule the ever pleasant land of the remembered, relegating La Muerte to the very grim land of the forgotten. However, if Manolo marries Maria Xibalba will stop meddling in the lives of mortals. Joaquin clearly isn't a good match for her. He believes a woman's place is at her man's beck and call, to make him food and clean up after him. Maria is a strong-willed character, and the filmmakers do a good job of keeping her from taking a back seat, or becoming the damsel in distress. Manolo on the other hand continues his passion for music in secret, while attempting to honor his family by becoming a matador. While he becomes a good matador, he refuses to kill the bull he's fighting, much to his family's dismay. This makes Maria quite happy. This filmmakers clearly took a lot of care to keep the moral high ground in every situation, and in that sense Manolo and Maria are kept blameless. This consequently makes for some fairly static main characters. While Manolo, goes on a journey, that journey doesn't affect a change in him. From the beginning, he's already the character we want him to be by the end. It's his job to prove to those around him why they should change. It's also curious why they keep Maria from making her choice for so long considering it's obvious who she prefers even when they are children. The fact that she wouldn't be happy with Joaquin is also obvious from their first few interactions after she comes back from school. Again, the filmmakers took so much care in keeping the moral high ground in all things, to the point where the competition between the two men never creates an anger or hatred in them. All three remain friends till the end despite anything that happens throughout the story. And despite his family getting offended at his unwillingness to kill a bull during a bullfight, a scene or two later they're happy together again as if nothing happened. While adults might find all the pleasantness a bit unlikely, perhaps it's better for the children in the audience to have these morally upright heroes. Manolo's storyline has a few other lessons for children as well. His family, particularly his father, demand he become a matador, but he never gives up on his dreams. In one important sequence toward the end of the film, he's even able to use his musical skill to solve a nearly unsolvable problem. The clear message being, be who you are, and pursue your dreams. His dream of being a musician in a mariachi band give the filmmakers reason to work in popular songs, even if they feel slightly out of place. We're treated to mariachi style covers of "I Will Wait" by Mumford & Sons’, and Radiohead’s “Creep.” Maybe a little less out of place, they also borrow a piece of Ennio Morricone's brilliant score to The Good, The Bad, and The Ugly for one scene. Having spent such a lengthy amount of time setting things up, we are left with a rushed journey to the finish. After being tricked by Xibalba to go to the land of the dead (or the land of the remembered), he has to find a way back in order to save Maria and the town they live in. The sequences spent in the land of the remembered are among the films most eye catching, but it takes the film such a long time to get there we hardly get to enjoy it. It's a shame we don't get to spend more time there. However, much the way a lot of these animated films turn out, it ends with a chaotic battle scene, and a musical party scene assuring us everyone will be happy ever after. It's chaos piled on top of chaos, and we never really get a chance to take a breath and think about the many morals the film tries to get across. It tries to hit all the appropriate themes for a younger audience: follow your dreams, use your strengths, don't kill animals needlessly; be yourself even if your family doesn't get it; friendship, love, strong capable women characters, and, of course, true love never dies. Everything is wrapped up with a nice bow on top. It's a little too on the nose. It's a rare children's film that aspires to teach younger audiences a little about another culture, and packs a film with morals quite so densely. As such I appreciate what this film tries to do. I just wish it hadn't tried to do quite so much.